Lee Oskar Blues Harp 'A' Major Diatonic The Major Diatonic harmonica is the most commonly used tuning for playing Blues, Rock, Country Folk & Jazz. Major Diatonic harps are produced by several manufacturers and all of these harmonicas have the exact same notation layout as the Lee Oskar Major Diatonic. The most important difference is in the quality of materials, construction, design and sound. Lee Oskars are the best harmonicas in the world, and thats not just our opinion. All over the world, professional players prefer Lee Oskar Harps over any other brand. Maybe you are an accomplished player but even as a beginner harmonica player why start at the bottom? 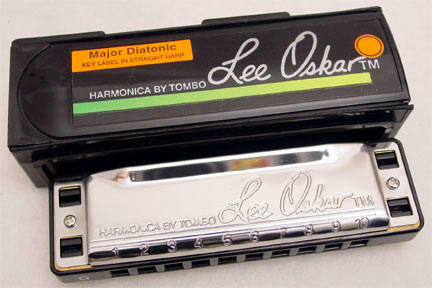 A true blues harp for anybody and everybody, Lee Oscar Harmonicas, the name of quality.